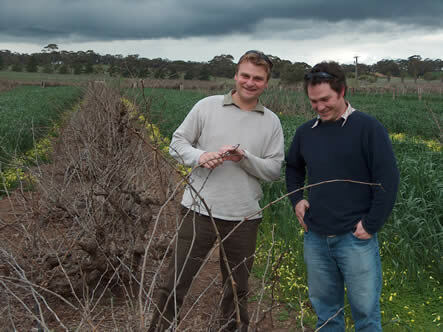 Massena is a collaborative effort between Jaysen Collins and Dan Standish; it’s one of the ‘New Barossa’ wineries I wrote up last year. I caught up with them both at Jaysen’s home for a lovely dinner and a chance to taste a vertical of some the wines made so far. I was quite impressed with what they’ve done, wnd with a few vintages under their belts now, it’s quite a track record that’s building up. The 2003 Moonlight Run and 11th Hour are a cracking pair of wines. Here are my notes. Sample of final blend. 750 cases made. It’s hard to assess, but there’s lovely ripeness and richness. Quite fresh with good acidity. Rich, sweet and chocolatey. Everything is there.